We will be updating this site frequently with all the important information required to keep you informed of what is happening, what to expect, and when. The information will be added as it becomes available. So please check back often!! 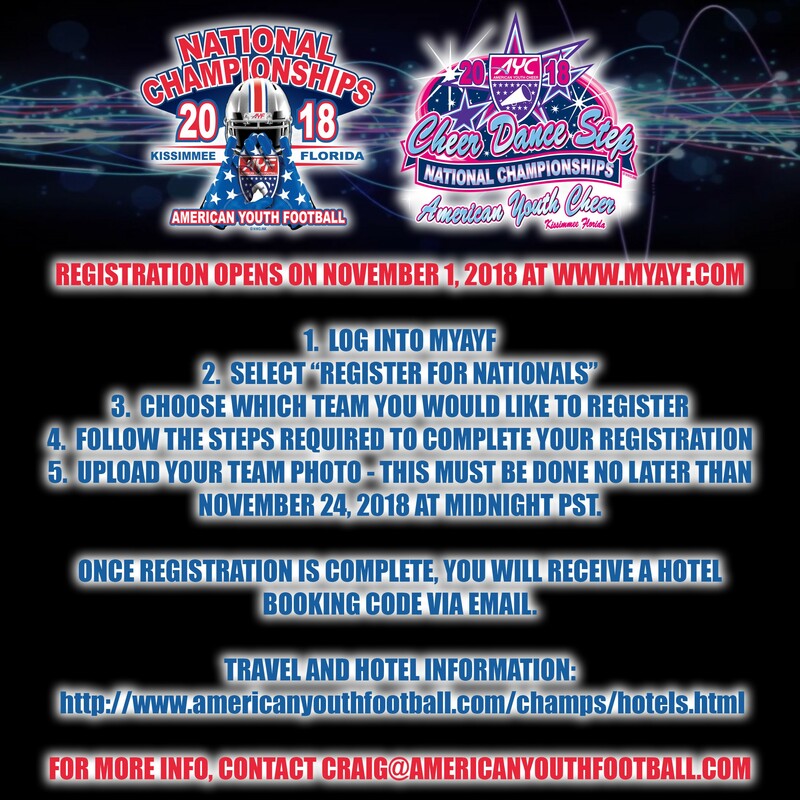 Sunday, November 18, 2018, the best of the best youth football teams in the New England Region will come together to play for the American Youth Football New England Region Championship title and the opportunity to advance to the American Youth Football National Championship playoffs in Kissimmee, FL. 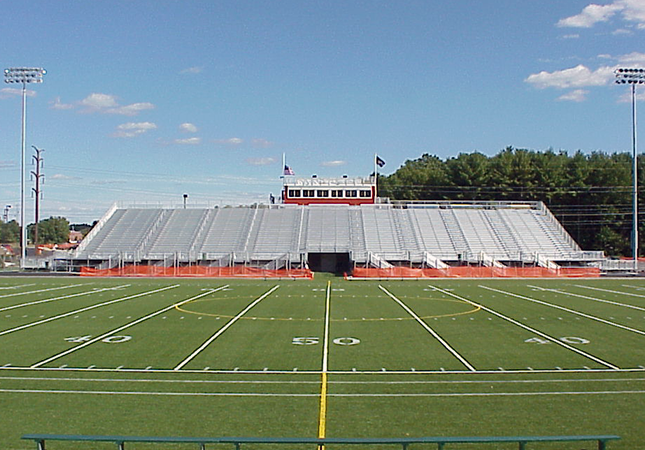 The 2018 New England Region Division 2 Football Championship games will be held at Stellos Stadium Motta Field located at 7 Stadium Drive, in Nashua, NH. Please review the important information below regarding football games, admission to the games, stadium policies, and award presentations. Big SHOUT OUT to our 2018 AYF New England Region Football Champions. All teams will advance to participate in the 2018 AYF Football Championship games the week of December 1st through December 7th. All Football games will be played under Federation rules. In the event of a tie, the Kansas City overtime tiebreaker procedure will be used. Game officials will consist of 5 on the field. Time keeper will be a game official. There is no charge for participating players, cheerleaders and coaches with event passes. Gates will be open one hour before game time. Team warm-ups will be at Nashua High School South. This warm-up field is less than 5 minutes away from Stellos Stadium. The NHYFSC has reserved 2 busses to transport the teams and coaches to the warm-up field. We will also have a volunteer on each bus to make sure the teams are brought back to Stellos in plenty of time for their game. Teams need to arrive 1 hour and 45 minutes before your scheduled game time. This timeframe allows for teams to arrive and be checked in at Stellos Stadium prior to heading to the warm-up field. If coaches and athletes arrive in separate cars, we will wait for all athletes to arrive before checking the team in. The high school has 2 other major events happening on Sunday the 18th so no association board members, coaches or parents are allowed to park at the high school. Their parking spaces need to be available for the events they are holding in the school. MAKE SURE YOU INFORM ANY SPECTATOR COMING TO SUPPORT YOUR TEAMS THEY ARE NOT ALLOWED TO PARK AT THE HIGH SCHOOL. No smoking, electric cigarettes, or vaping. No animals other than documented service animals. No air horns or similar type devices. The facility borders a residential area thus announcing of games may not begin until Noon. No alcohol in the parking areas and stadium. ​2 - Review all football cleats for any exposed metal. 5 - Coaches should bring an extra copy of their roster or a list of players names and jersey numbers for the announcers. 6 - Coaches to bring 2 copies of MPR form. (Download a copy from the Forms section). We follow AYF MPR's for region football games. 7 - Players should bring extra pair of dry clothes in the event of rain or snow so they may change after the game. 1 - Teams please arrive 1 hour and 45 minutes before your game time. 2 - Teams will be checked in 1 hour prior to game time unless otherwise advised. Check in will be conducted by Region/Host staff. a - If you arrive by bus instruct the driver to drop the team off at the front of the stadium. The bus will then be instructed where to park. 3 - All teams must have 2 game jerseys (home and away). Any team that does not have 2 game jerseys must contact the prior to advancing. 4 - No individuals will be allowed on the sidelines except credentialed coaches for the team playing and Region, Conference, Association Officials. 5 - At the conclusion of each game, teams will exit the field to the award presentation area. Please exit the playing field as quickly as possible at the conclusion of the game so the next scheduled game can begin. Remember to take all your belongings and clean up before leaving the field. The Gates to the field will open one (1) hour prior to the start of the first game of the day. Tobacco products of any kind are not allowed within the field area. Dogs and other pets or animals are prohibited on the field surface area or in the field area at all times unless they are service animals. All participants, coaches and spectators will conduct themselves in a manner displaying good sportsmanship throughout the event. This is the time when all books and documentation will be reviewed, verified and certified. Please make sure you have all the proper paperwork as listed to ensure there is no problems with your teams. These are all required documents for participation in all Regional and National Events. These documents will need to travel with the team at all times from this point forward. These documents will be retained by the National Office for advancing teams upon check in. Teams have 72 hours to register for Nationals once they qualify. Once you qualify at your local regional event you MUST take the following steps to register your team(s) for National Participation. Any Entries past the due date are not guaranteed a place in the tournament and will risk coverage in event media. Click on Member Profile tab. Click on Register for Nationals. Ensure that all team details are set and accurate, including: Team Name, Division, Coaches, Team Contact. Have a team picture (in jpg format, a minimum size of 300 dpi) on your computer and ready to upload. Deadline to upload the team picture is November 24th at midnight. Submit credit card or check information for the entry fee payment. Once your payment is complete, you will receive your "AYF REGISTRATION CONFIRMATION NUMBER and TEAM BOOKING CODE’ which will allow you access to book rooms in the mandatory hotel accommodations. Any team reservations made without this code will not be eligible for participation. All qualifying national championship participants (football and cheer) will need to have ALL FORMS and ID's certified by their local Conference and Regional Representatives. All requirements MUST be completed in order to be eligible for play. There will be no exceptions. All necessary forms can be found on the Forms Link. All Participants are required to stay at approved hotels. More information can be found on the Travel & Accommodations page. NEW ENGLAND REGIONAL CHAMPIONSHIPS... GOOD LUCK! !